This makes Singapore the fifth most preferred destination among Chinese real estate capital investors. Hong Kong remained the first choice at a record of US$9.5 billion in deals. United States (US$2.33 billion) was second, followed by Australia (US$1.74 billion) and the United Kingdom (US$712 million) in the previous year. In a recent 2019 survey, 14% of Chinese property investors are seeking to invest in Singapore, 10% in Germany, with Canada at (6%), New Zealand (6%) and Malaysia (4%). Meanwhile, more than half of Chinese investors were looking at the following markets: US at 35%, UK and Australia (24%) and slightly lower, Hong Kong (18%). Aside from Goodluck Garden condo by Perennial Real Estate and Qingjian International in November, two others included the US$157 million buyouts of Jalan Jurong Kechil development site sometime in September and the US$38 million development site at 623A Bukit Timah Road in April last year. However, the dull business climate caused by the aggravating trade tension and stricter controls on capital outflow has led Chinese real estate investors to become more inclined to asset disposal than acquisitions. Singapore expected to have US$1.4 billion in sold assets in the previous year, including the US$517 million sale of an office at 77 Robinson Road by CLSA Capital and the US$426 million sale of an industrial site at 20 Tuas South Avenue 14 by REC Group. Cushman & Wakefield anticipates that US, UK, Australia, and Hong Kong will be the top choices for Chinese real estate investors whilst investing in other countries such as South Korea, Malaysia, Canada and nations outside the UK, such as Germany and Europe, will be less in the succeeding months. 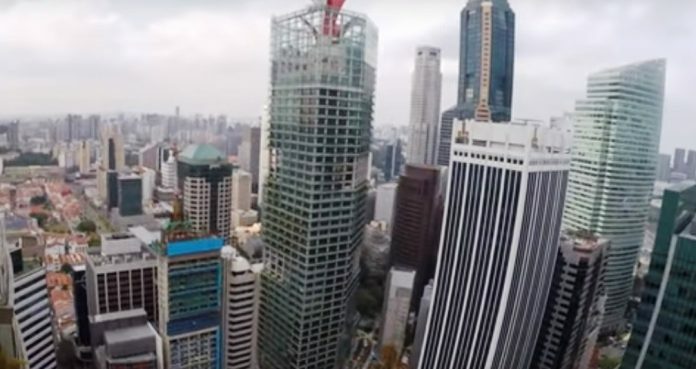 In 2018, among the Asia Pacific region, Singapore remained the third biggest real estate capital investment compared to other countries, according to Knight Frank, a UK real estate company. Singapore outflows climbed 35% from US$14.8 billion to US$19.9 billion, higher than China’s growth (8%) but a bit lower compared to Hong Kong (41%).